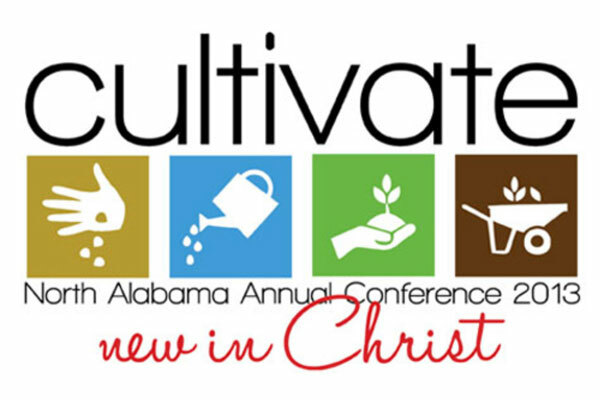 Click here to download your 2013 North Alabama Conference Journal from the online Journal Library. On Sunday afternoon, June 2, 2013, United Methodists from across North Alabama gathered on the campus of Birmingham-Southern College for the 2013 North Alabama Annual Conference. The afternoon session opened with the singing of “And Are We Yet Alive” led by this year’s Conference worship leader John Elliott. Chair of the Episcopacy Committee Dr. Andy Wolfe introduced Bishop Debra Wallace-Padgett who is serving her first year as the presiding Bishop of the North Alabama Conference. During his introduction Rev. Wolfe made a motion to accept Bishop Wallace-Padgett and her husband Lee Padgett, an ordained Deacon, as honorary members of the North Alabama Conference. The motion passed. The Bishop then officially called the Conference to order and invited Gen. Charles Krulak, president of Birmingham-Southern College, to welcome members to the college. In his greeting he reminded those gathered that BSC is “your campus.” He also shared that as a Methodist-related college BSC strives to provide an education to touch students' souls. He shared a video of a march the campus held in April to honor the 50th anniversary of BSC student Marti Turnipseed joining seven African-American students at a sit-in at a segregated Woolworth’s food counter in downtown Birmingham. Following the video, BSC Chaplain Rev. Jack Hinnen led the Conference in an opening prayer. Gen. Krulak then extended the invitation for the 2014 North Alabama Annual Conference to meet on the campus of BSC. Conference Secretary Rev. Sherill Clontz then led Conference members through the organization of the Conference by setting the bar (voting area) and determining which reports are on the Consent Agenda and which will be voted on separately. Clergy and laity then went to the Clergy executive session and lay orientation session, the only time the lay and clergy attending Conference meet separately. During the afternoon, Conference members and visitors had an opportunity to visit the mission displays to learn more about United Methodist-related ministries throughout North Alabama. Following a dinner break, Conference participants gathered once more in Bill Battle Coliseum for an opening worship celebration. The service celebrated the rich diversity of United Methodism in North Alabama and featured a hand bell acclamation, spirited organ music, a mass choir, a prayer of thanksgiving in the Korean tradition, commissioning North Alabama’s campus ministries leaders and the sharing of Holy Communion. During worship, Bishop Wallace-Padgett preached the sermon “Becoming New in Christ.” She noted that “New life in Christ starts with Cultivation.” She affirmed the spirit and discipleship she has seen in North Alabama United Methodists saying, “Jesus is not just someone you talk about or read about. Jesus is your friend…your savior…your strength in your life.” She encouraged each individual to continue to become new in Christ through intentional Holy Habits. Following worship, Mission2Gather, a group of North Alabama United Methodist ministries, held a 5k run / 1 mile fun walk. Runners and walkers enjoyed the fellowship and helped raise money for these eight ministries working together to engage persons in mission and ministry to those in need. Winners of the race will be announced during a business session of the Conference. Monday morning of Annual Conference began with worship led by John Elliott. Bishop Jonathan Holston then led the Conference in Bible study reminding Conference participants that “everyone has a story” and as a church our job is to make disciples not just church members. As business began the Conference passed the consent agenda. The first report was from Conference Lay Leader Steve Lyles who presented the Lay Ministry Team report and affirmed the ministry of so many helping to work toward the church’s mission of making disciples of Jesus Christ for the transformation of the world. Convenor of the Evangelism Team Rev. Robert Sparkman then announced this year’s winners of the Harry Denman Evangelism Award. Lay winners are Davie Williams of Center Grove UMC and Dr. Hardin Coleman of Scottsboro First UMC. Rev. Matt Scott pastor of The Gathering Place UMC received the clergy award. The Conference then heard from Blake Horne, President and CEO of the United Methodist Children’s Home. He shared about the ministry of UMCH. The ministry continues to adapt to meet the needs of children in Alabama. One new focus is that the group homes in Tuscaloosa and Florence will focus on helping their residents achieve a college degree. At the end of the report the Conference passed a motion by UMCH to amend their bylaws. The Conference then heard reports from the Conference Council on Finance and Administration. The Conference approved a budget for 2014 of $9,777,797. The Conference then voted to make an unrestricted gift to Birmingham-Southern College of $1 million. The gift will be financed through internal loans, modeled on the method the Conference used to finance the building of the current United Methodist Center. Brant Sanders, Chairperson of the Conference Board of Pension and Health Benefits, then presented the report of that committee. During the report he announced there will be no increase in the health insurance premiums charged to Healthflex participants during 2014. However, increases will be covered through reserve funds. He also noted that how national changes in healthcare will affect Healthflex is still being studied. The Board of Pension and Health Benefits will present a full report at next year’s Annual Conference. The Conference then voted to adjust the formula used to calculate clergy pension benefits local churches pay each month. The new formula is 50% comparable to the formula used to calculate church apportionments and 50% to be allocated based on the average cost per full-time equivalent clergy serving each local church. The Conference then voted to change the standing rules of the Annual Conference to allow the 2014 North Alabama Annual Conference to elect delegates to the 2016 General and Jurisdictional Conference. This change is in line with legislation the General Conference passed which allows Annual Conferences to elect their delegations one year earlier to allow for better preparation. Rev. Nancy Cole then presented the report of the Disaster Recovery Team. United Methodists are still at work helping recovery efforts from the April 2011 tornadoes. She announced the Conference expects at least one more year of Disaster Recovery work. She thanked the many people who have help with the recovery efforts and noted that North Alabama has received UMCOR Grants of $2.15 million and almost $2.7 million in in-kind services from volunteers from both North Alabama and many other parts of the country. Rev. Randy Burbank, the Conference Disaster Response Director, then greeted the Conference and shared his goal is to help the Conference be more proactive in preparing for Disasters. The Conference then took a lunch break. During this time the Lay Ministry Team hosted the Laity Luncheon which featured music by Rev. Keith Elder and a message by Dr. Cam West, the president of Huntingdon College. John Elliott opened the afternoon with worship and Bishop Holston led a Q&A session based on his teachings from the morning session. During business sessions throughout Conference, members voted on four amendments to the United Methodist Constitution that will adjust the Constitution to be in line with actions of the 2012 General Conference. Bishop Wallace-Padgett then took a moment to share about a process she, the District Superintendent and some members of the extended Cabinet are undertaking led by Spiritual Leadership, Inc. This process is one in which they are focusing on their personal growth and leadership skills. By meeting together eight hours each month they are supporting and holding each other accountable in these areas. She encouraged each participant of Conference to also focus on their own growth to best be able to do the ministry to which God is calling us. Rev. Nancy Cole then presented a report on her new role as director of Church Transformation and Revitalization. This effort includes not only Natural Church Development but also other efforts to equip existing churches from growth. She also shared about a process specifically designed for small membership churches called Abide. Rev. Clay Farrington, former Youth Ministry Coordinator, then announced the winners of the Youth Battle of the Bands which took place at Conference earlier in the day. Winners include (3rd place) Riverchase UMC; (2nd place) Cove UMC and (1st place) Gardendale-Mt. Vernon UMC. Clay then introduced the Conference to the new Youth Ministry Coordinator Micah Dormann. Linda Holland presented the Nominations report. The Conference elected those nominated Conference leaders. The Commission on Archives and History presented the annual Annie Ford and Glynn Wheeler Award for outstanding contributions in the field of local church history. This year’s winners are Ann Neighbors of Alexander City First UMC and Joe Coughton of Trinity UMC in Huntsville. The Commission also recognized three congregations who have qualified for the Charter Church award. They are Jacksonville First UMC, Center Grove UMC and Turkeytown UMC. Conference Secretary Rev. Sherill Clontz then presented the report of the General Commission of Race and Religion audit of new churches in North Alabama. This audit was requested at a previous Annual Conference. The draft report has been given to North Alabama and Rev. Clontz shared we are expecting the final report soon. The draft noted three recommendations including creation of equitable plan for new church starts; training for leaders; developing a strategic plan (including funding) for new church plants. She also noted that the Conference New Church Team will give a full report regarding North Alabama’s plan to undertake these recommendations at next year’s Annual Conference. The final report of the afternoon came from the area of Ethnic Ministries. Dr. Thomas Muhomba reported on the growth of the ministry with different ethnic reports. He then introduced the incoming Conference Director of Ethnic Dr. Richard Stryker. Bishop Wallace-Padgett noted that Stryker will led this ministry as his full-time appointment as a emphasis on the Conference to grow in diversity. Dr. Stryker thanked Muhomba for his six years of leadership, shared he is already working with a team to lead the Ethnic Ministries ministry of the Conference and invited everyone in the Conference to Worshipful Launch for New Ethnic Ministries Strategy on Sunday June 23 at 3 p.m. at New Beginnings UMC in Birmingham. The Conference then moved to Vestavia Hills UMC for the Service of Ordination, Commissioning and Licensing. Bishop Wallace-Padgett preached a message reminding those gather that we are all called to be followers as the Conference welcomed new licensed local pastors, commissioned provisional members and ordained deacon and elders. Tuesday morning of the 2013 Annual Conference began with a time of worship led by John Elliott and a time of Bible study led by Bishop Jonathan Holston. As Bishop Debra Wallace-Padgett opened the morning business session, she read a letter of thanks from the President of Birmingham-Southern College Gen. Charles Krulak. He thanked the Conference for its gift of $1 million to BSC and affirmed the importance of a strong relationship between BSC and The United Methodist Church. Rev. Larry Wright then spoke on behalf of the retiring class and offered encouragement to the incoming class of ordinands and licensees. Rev. Henry Prater, a newly ordained Elder, then addressed the Conference. Gresh Harbuck who will be the pastor of ONEighty UMC. This congregation began as a satellite congregation of ClearBranch UMC, but is now taking the steps to become an autonomous congregation. David Carboni will be become the Executive Pastor of The Gathering Place. This new congregation has almost 800 people attending worship each week and has celebrated more than 100 professions of faith this year. The Gathering Place’s pastor Matt Scott was awarded the 2013 clergy Denman Evangelism Award on Monday. Clinton Hubbard is the pastor of New Beginnings UMC. This new church situation began as the merger of three existing congregations. Jones explained New Beginnings is defying the odds of church mergers and has already grow 25 percent larger than the sum of the three previous congregations. Scott Smith will join the pastoral staff of Crosswinds UMC. This congregation pastored by Michael and Susanne Katschke, will start a satellite congregation. Jones also introduce Marcus Singleton pastor of Living Faith Community UMC. This new congregation was planted last year and will be the sole recipient of New Church Builders Funds for 2013. The New Church Builders Fund is the only money given to new churches to help with capital expenses. For information on how to make a donation to the New Church Builders Fund contact the Office of New Church Development at (256) 489-3951. Following the introductions Bishop Wallace-Padgett said a prayer for these church planters. The Convenor of the Conference Commission on the Status and Role of Women (COSROW) Eula Thompson then present the Louise Branscomb Barrier Break Award. This annual award recognize a United Methodist willing to risk and stand up for the rights of women and ethnic minority persons. The 2013 recipient is Rev. Susanne Katschke, co- senior pastor of Crosswinds UMC. In her acceptance speech, Rev. Katschke noted that in order to be a barrier breaker you have to have your heart broken by someone’s circumstances. She then shared about working with the hard-hit community of Harvest following the deadly April 2011 tornadoes. She has helped get a grant to build a storm shelter for the community to provide a safe place during future storms. Reverend Dr. Eley Bert Goodwin Jr.
Reverend Thomas Leonard McMinn, Jr. The afternoon business session was opened by the winner of this year’s youth Battle of the Bands. The Gardendale-Mt Vernon youth band will also lead worship at the Encounter youth retreat next February. The children participating in Annual Conference Kid’s Camp then present Bishop Wallace-Padgett a “welcome” banner and sang for the Conference. Several of the children assisted Conference Children’s Coordinator Liz Bowlin in presenting the children’s ministry report noting upcoming events for children and training events for children’s workers. Bowlin then also presented about the Conference’s Safe Sanctuary policy. The Conference earlier voted to make some changes to the policy. She also noted that the Conference is working on a similar policy addressing the needs of vulnerable adults. The Conference then heard from the Chair of the Board of Higher Education Rev. Brian Erickson. He presented a strong message of why the Conference should support its campus ministries noting that the Methodist movement began with college students. He also noted the Conference is developing a Dashboard for its campus ministries. Rev. Peter von Herrmann then presented the report of the Adult Discipleship Team. He announced the team will be working on a curriculum review portion of the Conference website to allow teachers and small group leaders to review and share insights on curriculum. Deaconess Judy Poole then presented the winners of Sunday night’s 5k run / 1 mile walk for Human Need which raise approximately $5000 for the Mission2Gather ministries. Rev. Robin Scott, District Superintendent of the Mountain Lakes District then presented the report for Sumatanga. He noted that simply managing itself efficiently was not enough for Sumatanga to be financially sound. He said it would take support of the Annual Conference, its local churches and individuals for the success of Sumatanga. He said the Cabinet and Conference has taken the first step in appointing Rev. Mark Paris as Director of Development for Sumatanga. Rev. Paris' whose sole appointment is to help tell the story of the camp and to raise funds for the camp. Scott noted that in the last year less than 20% of local congregations in North Alabama used the camp facilities or sent campers to events at Sumatanga. He made a plea for the Conference to “vote with its actions” that it wants Sumatanga to have a future. These actions include local churches using the camp facilities for retreats; congregations sending campers to events; including Sumatanga in local church mission budgets; and individuals making financial donations to the camp. He introduced Sumatanga Interim Executive Director Director Jan Thomas and Board of Trustees Chair Scott Gilpin to the Conference. Quint Harris then spoke about the Fellowship of United Methodists in Worship Arts and invited participation in the group. Rev. Adlene Kufarimai then presented about Imagine no Malaria. Imagine No Malaria is a $75 million effort of The United Methodist Church to eliminate malaria deaths in Africa by 2015. The comprehensive approach includes prevention, education, outreach and treatment. She introduced the North Conference Imagine No Malaria Team and announced the Conference goal of raising money to save 100,000 lives in the next year. The Conference then thanked Rev. Sherill Clontz for her dedicated work as Conference Secretary and elected Rev. Clauzell Williams to serve as Conference Secretary through 2015. The Conference then voted to hold the 2014 Annual Conference, which will be June 1-3, on the campus of Birmingham-Southern College. Annual Conference then closed with a Service of Prayer and Sending Forth. Rev. Wade Langer led the Conference through worship and times of prayer. Bishop Wallace-Padgett announced the clergy appointments fixed then read the appointment changes. Each District lay leader prayed for the clergy, laity and ministry of the local churches in their District.